National and international figures relating to the practice of modern British art in the town will be covered in depth – from Ben Nicholson, Peter Lanyon and Barbara Hepworth to Piet Mondrian, Naum Gabo and Paule Vézelay. Their links to the wider story of British art will also be revealed, such as the work of Keith Vaughan, who joined Patrick Heron’s Space in Colour exhibition in the early 1950s and later came to St Ives. Additional works will allow the story of St Ives to be expanded and reframed in light of new research and recent acquisitions. 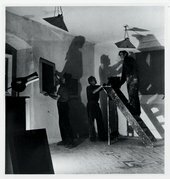 The display will explore new perspectives on the shared legacies of constructivism around the world, as well as highlighting links with international figures such as Li Yuan-chia, a Taiwanese artist who came to the UK in the 1960s and became a close friend of Winifred Nicholson. Far from being an isolated or self-contained community of artists, St Ives will be celebrated as a point of connection in a global network of ideas and debates about art and its place in the world.